Ayanna Pressley is running to unseat veteran Democratic Rep. Mike Capuano. Ayanna Pressley is in a hurry. The 44-year-old Boston city councilor, running to unseat veteran Democratic Rep. Mike Capuano with a slogan, "Change Can’t Wait," evoking President Obama’s insurgent 2008 presidential campaign, hammered that message home in a session with faith leaders and supporters at Roxbury Presbyterian Church on Sunday. "Now is the time to be bold," Pressley, the granddaughter of a Baptist minister, said to cheers from the crowd. "This is not my moment, this is our moment." 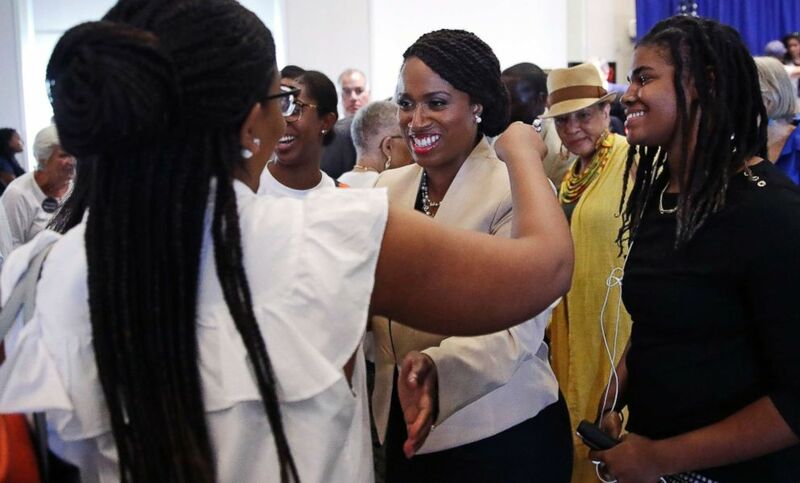 Pressley, who served as an aide to former Sen. John Kerry and Rep. Joe Kennedy II, is the first woman of color to serve on the Boston city council, and is hoping to become the first African-American woman to represent Massachusetts in Washington. 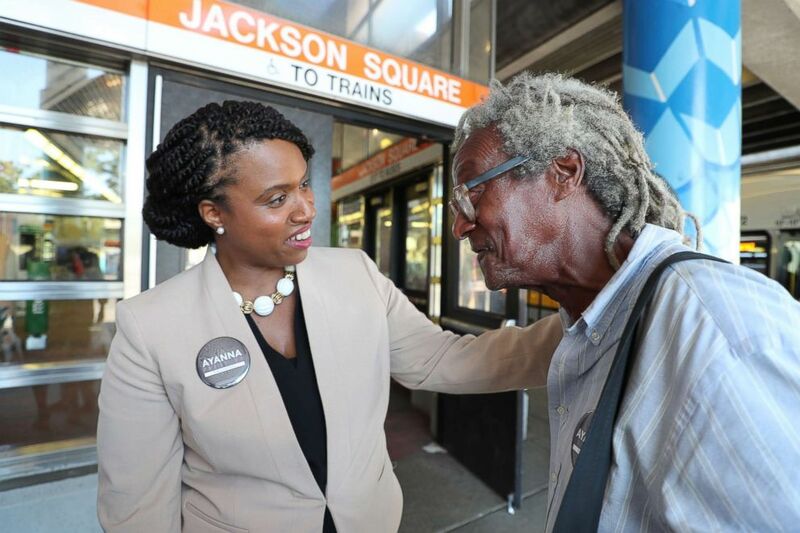 (Matthew J. Lee/The Boston Globe via Getty Images) Boston City Councilor and congressional candidate Ayanna Pressley talks to Jeffrey McNary as she campaigns against Michael Capuano at the Jackson Square MBTA Station in the Jamaica Plain neighborhood of Boston on July 10, 2018. Her campaign against Capuano — a former mayor of Somerville with a strong progressive record — seeks to harness the energy on the left following the surprise upset in New York of Rep. Joe Crowley, D-New York, a member of House Democratic leadership, by 28-year-old Alexandria Ocasio-Cortez, a former Bernie Sanders organizer and first-time candidate. Pressley's supporters say that the representative of Massachusetts’s 7th Congressional District should be a leader in Washington and the party, forcing both to the left at a time when Democrats are grappling with their identity. Once represented by John F. Kennedy, the state’s only majority-minority district is among the most socially and economically diverse in the country, stretching from Cambridge and Somerville to lower-income Boston neighborhoods like Roxbury and Mattapan. "She’s really challenging us. She’s challenging Michael, for sure, but she’s challenging the voters of the district," John Walsh, a former Massachusetts Democratic Party chairman who has endorsed Pressley, told ABC News. "When a choice comes within our party, I want the person I’ve sent to be pushing us to the left. And I think that’s really the opportunity with Ayanna," he said. City officials in Boston were jubilant in December 2016 when they announced a $30 million grant to redevelop the Whittier Street housing development in the city’s Roxbury neighborhood. "This is one of the best announcements I have ever made in my political life," Boston Mayor Marty Walsh said to cheers. Capuano, who helped secure the funds, joked that he "spent the last two months pushing every single administrator in Washington to get every single piece of paper they can off of their desk before January 20," ahead of President Donald Trump’s inauguration. Capuano's record delivering for his district is central to his pitch for re-election. Throughout his career, he’s brought home millions of dollars for infrastructure, public housing and community health centers. His seniority would become even more valuable if Democrats take back the House, which would give him more influence over legislation considered by the Transportation and Financial Services Committees, should he remain on both panels. "The whole concept of change for change's sake, I get it, I won’t argue with anyone about that, but I think that the average voter wants the best fighter they can get for the issues they believe in and I think in this case the record speak for itself," Capuano said during an event with supporters and Mayor Walsh, who has endorsed his reelection bid. "He was progressive before people talked about being progressive," Walsh said. "He wore it on his sleeve proudly." Evelyn Ortiz, a 49-year-old stay-at-home grandmother and resident of the Whittier Street public housing development Capuano has helped redevelop with federal funds, said she’s satisfied with the congressman’s performance, and plans to support him. "He’s been doing us very well," Ortiz said. "I don’t care on what color you are, but it all depends on what you deliver. I am happy with him." Pressley's supporters don’t argue with Capuano's record of progressive votes in Congress and results he’s delivered to Boston. "I’ve been overwhelmingly happy with the votes he’s taken," said Walsh, the former Massachusetts Democratic Party chairman. Pressley, mingling with voters and supporters in Cambridge – including one volunteer who traveled from Philadelphia – said that the district requires "more than a reliable vote." (Charles Krupa/AP) Boston City Councilor Ayanna Pressley, center, who is challenging Rep. Michael Capuano, is surrounded by supporters following a debate at the University of Massachusetts, in Boston, Aug. 7, 2018. "Having a more progressive voting record in the most progressive seat in the country is no profile in courage," she said. Rob Parker, 29, a nurse practitioner student from Somerville, who had previously supported Capuano, said he’s decided to back Pressley because of her profile and background. "It’s really, really important to bring new voices, more diversity into our politics, especially in the current climate and I think that Ayanna would bring in fresh ideas," he told ABC News after meeting Pressley in Cambridge on Sunday afternoon. 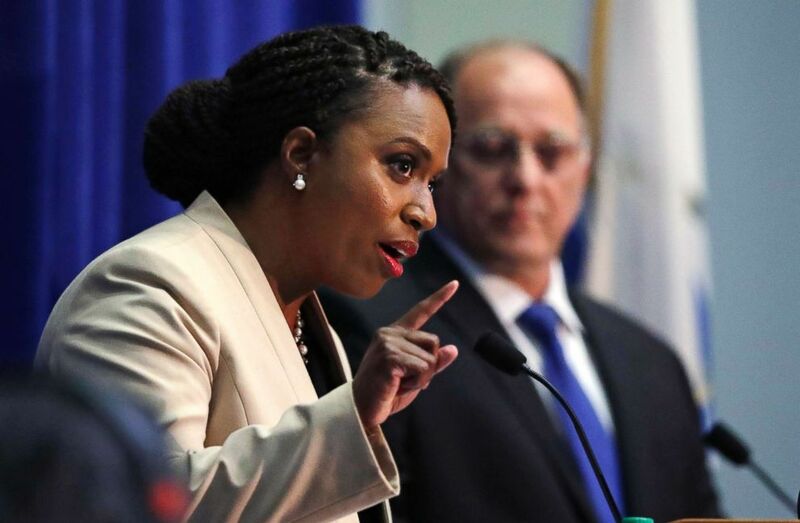 While both candidates have said they would largely vote the same way in Washington, Pressley has drawn some contrasts with Capuano's progressive record, which includes votes against the Iraq War and longtime support for single-payer health care. She's called for abolishing ICE and has vowed to oppose any funding for a border wall with Mexico, something that Capuano said he would support in exchange for larger immigration reforms sought by Democrats. They have also split on issues regarding law enforcement. Pressley has criticized Capuano's vote for a "Blue Lives Matter" bill in the House expressing support for police officers that would toughen federal penalties for assaulting police officers. She has said she supports both the message and tactics of NFL players kneeling during the national anthem to protest police brutality. Capuano, in a recent debate, said he agreed with the message from NFL Players, but said kneeling was counter-productive, a point that Pressley has sought to draw attention to. While national Democrats and analysts watching Tuesday's primary expect Capuano to successfully defend his seat, the race, in a sign of its competitiveness, has divided the Massachusetts congressional delegation, an unusual phenomenon for a primary without a scandal-plagued incumbent, according to Kyle Kondik, a political analyst and managing editor of Sabato's Crystal Ball at the University of Virginia's Center for Politics. Capuano has been endorsed by most of the congressional delegation – including Reps. Katherine Clark, Joe Kennedy III, and former Gov. Deval Patrick – along with national political leaders and colleagues Reps. John Lewis, D-Ga., Maxine Waters, D-Ca., and Luis Gutierrez, D-Ill.
Pressley, who has been endorsed by the Boston Globe and Boston Herald newspapers, also has the support of Massachusetts Attorney General Martha Healey. (Charles Krupa/AP, FILE) Boston City Councilor Ayanna Pressley, who is challenging Rep. Michael Capuano, D-Mass., gestures during a debate at the University of Massachusetts, in Boston, Aug. 7, 2018. Other prominent Massachusetts politicians – including Sen. Ed Markey and possible presidential candidates Sen. Elizabeth Warren and Rep. Seth Moulton – have remained on the sidelines. "A good race, good candidates, and it’s been a very well-run campaign by both sides, and I don’t want to say anything more than that," Markey said in a brief interview at the Capitol last week. Both candidates are continuing to fight for support just days from the election. Gerald Bergman, 73, a retired social worker in Cambridge who has yet to make up his mind, said he’s "conflicted" about his vote after discussing foreign policy with Pressley on Sunday. "We have somebody, I think, who can more capably represent women and people of color," he said of Pressley, before turning to Capuano. "We have a ten term congressman who I think has been good on not only domestic issues but international issues."